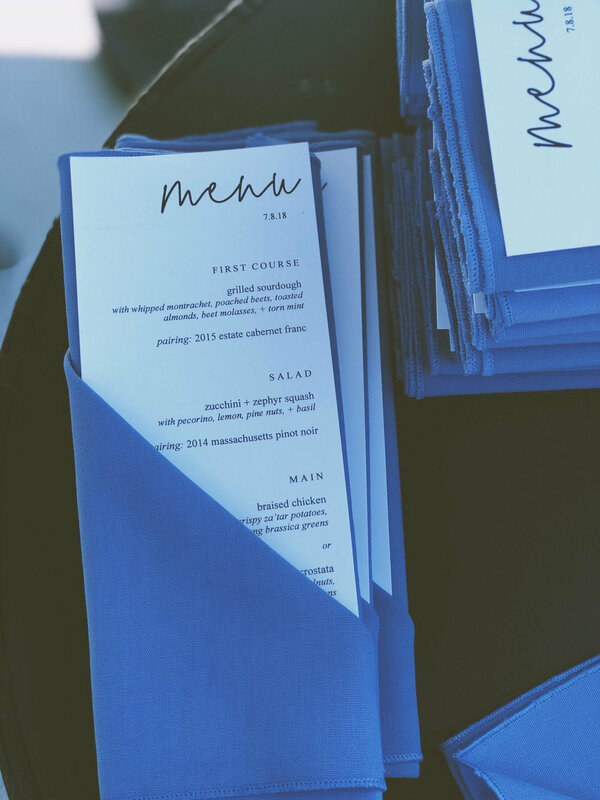 Paper and stationary goods play a large role in establishing the aesthetic of your event — and for us, the dinner menu is at the forefront. We offer simple, classic menu designs at an affordable price that will complement the style of service and food we are serving. We will work with you to determine exactly what you are envisioning the feel of your event to be and bring that to life through the menus, either placed at each setting or along a table. We can use aspects of save the dates and wedding invitations to pull together a larger theme or create something more unexpected — it’s completely up to you. We’d love to work with you on menu design and printing as part of the wedding planning process. Contact us for an estimate. There is a lot that we can do with a dinner menu and your personal preferences will play the biggest role in the final outcome. The style of service may also play a role in the final version of the menu and how many will be printed. For example, for a buffet style service, we often have two large menus placed at the buffet and small signs in front of each dish. We can also situate an A-frame chalkboard menu at the start of the buffet. Family Style service often lends itself to one menu per table to let guests know they will be sharing platters of food between them. For plated meals, we often print one menu per person. That being said, all of these decisions are customizable depending on your preferences. Bar menus are a lot of fun to create. Pictured is a simple menu featuring two signature cocktails. The cocktails are painted with watercolors and then outlined. In this case, the couple selected their font and shared with us what they wanted included on the menu. Apart from paper menus at the bar, we can create A-frame chalkboard menus that will be situated in front or on the side of the bar as guests approach. Beer, wine, and cider can be listed on the menu as well, or simply displayed on the bar itself for guests to use as a visual menu. For food truck and buffet service, chalkboard and A-frame menus work tremendously well. The creativity that the chalkboard style allows pairs nicely with the more casual tone of these events. We can create these menus to your taste — let us know exactly what you’d like included, from dietary information to illustrations, and we can make it happen.